I was born in Pennsylvania, and moved to the South (more specifically, North Carolina) when I was almost 5. As such, I was raised in the South, but I've never really embraced it enough to call myself a Southerner. I also have weird Yankee tendencies that I have no reason to have, like calling the oblong things you put on ice cream "jimmies." My point here is that even though I was raised here, I honestly have no idea whether or not the two recipes I chose out of this cookbook could be considered Southern cuisine, or if they're something that people anywhere eat. 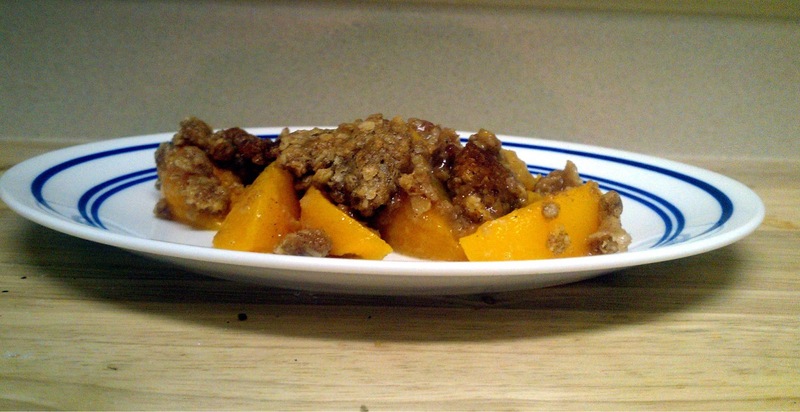 Macaroni and cheese seems like a fairly universal kind of thing, but what about a peach crisp? 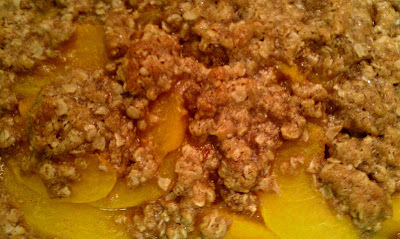 This recipe is super easy, and even Dennis, who doesn't really like peaches that much, enjoyed it. (I realized after I'd planned to make this, the actual day I was planning to make it, that he doesn't like peaches. When I told him what I was doing, he said he'd try it anyway, and it didn't kill him, so I consider that a win. What a trooper. 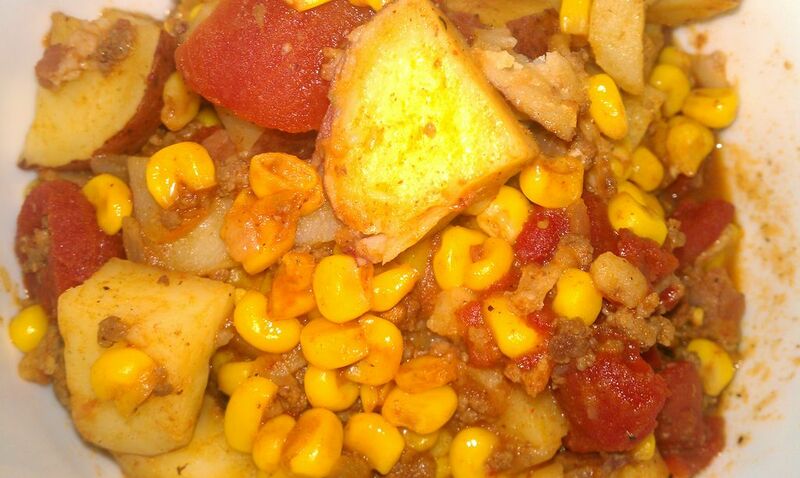 This recipe is really easy and would be good for a last-minute potluck. Put the peaches in an 8x8-inch pan. (The original recipe said to "arrange" the peach slices, but after "arranging" a layer on the bottom of the dish, I just dumped in the rest. In another bowl, mix together the butter, cinnamon, brown sugar, oats, and flour. 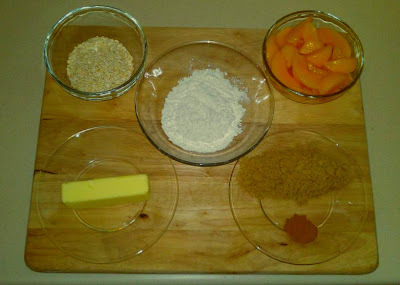 Spread this mixture on top of the peaches. Bake for about 20 minutes until browned. Cross-posted on She Likes to Bake. I asked Dennis to pick out the cookbook for this week, and he chose this one, Southern Plate. This one came from the library book sale for the library where I used to work The weird thing about the book is that it's not really. . .organized in any particular manner. There are chicken recipes beside pie recipes beside recipes for iced tea. I don't really get it, but probably, that's the way a Southern cookbook should be: Kind of lackadaisical, a little out of order, carbtastic, and delicious. Velveeta isn't something I use a lot of, but when I made this recipe, I forgot why. I don't think any other kind of cheese (or "cheese") could have been used in this to make it as good as it turned out. It lasted for a little while, and I had the last little bit of it covered in tomato soup for lunch one day. Really, really tasty. 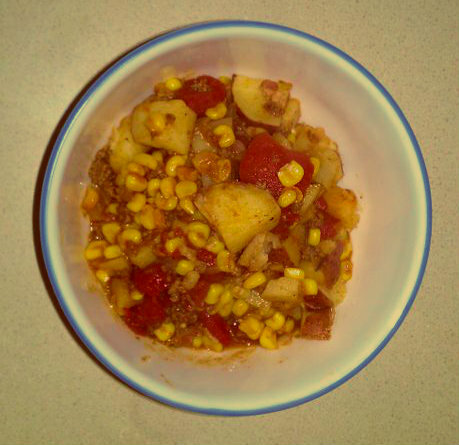 The ingredients in this were really easy to remember (2 of everything), but then I went and cayenne'd it up. You could add 2 tsp. if you really wanted, but I found it was good with just the one. I also found a couple lonely tomatoes in the fridge after I'd taken the ingredient picture and decided to slice them on top. It made a nice addition. Cook the pasta according to the directions on the package, about a minute less than you would for it to be completely done, the drain well. 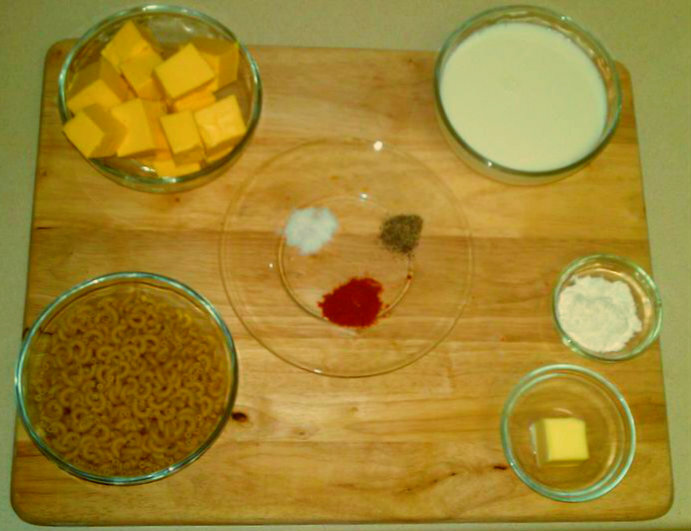 In a bowl (microwave-safe, please), melt the butter (in the microwave.) Stir in the flour, then stir in the milk. Season with as much salt and pepper as you'd like. 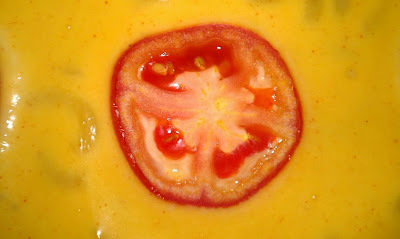 Put in the Velveeta, and microwave the mixture at short intervals until the cheese ("cheese") is melted, stirring after each bout in the microwave. The cookbook suggested microwaving this mixture in 30-second intervals, but I found I don't have that kind of patience, and I tended to do it for a minute or so each time. Note: It is going to seem like you're doing this FOREVER, that it's never going to end, and that the dang Velveeta is never going to liquefy to a good place. Trust me. It's all worth it in the end. 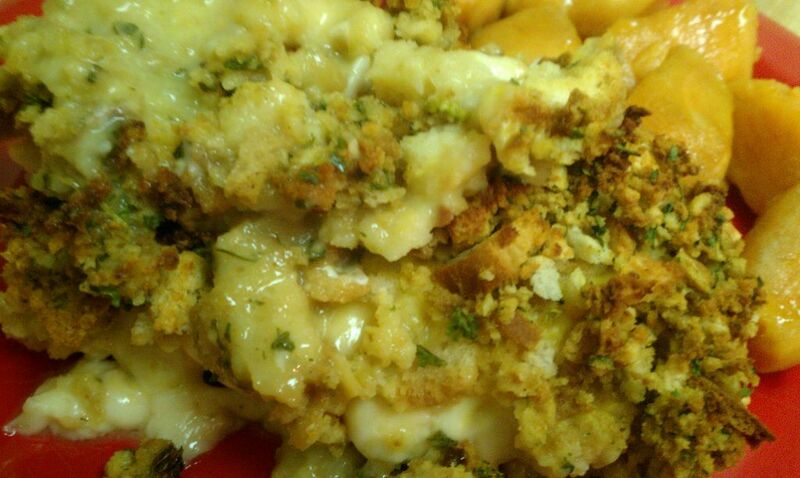 Once everything's melted, stir in the macaroni. Put the mixture in a casserole dish (I used an 8x8) and bake. Check at 20 minutes to see if it's become bubbly and if it's begun to brown around the edges. I ended up baking mine for 35 minutes, so your baking time may vary. When I took it out of the oven, it didn't look like it was going to solidify in the way macaroni and cheese needs to, but after it sat for a while, it was awesome. I learned something about chicken with this recipe. I've made whole chickens many times, but I never realized how different the cooking times were according to the weight. I guess that's because the chickens I've used have all been roughly the same size. 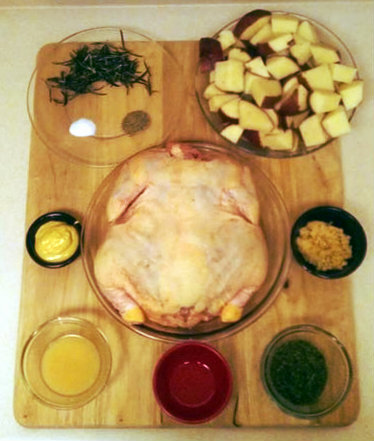 This was almost a five-and-a-half pound chicken, and I tried to cook it for the same amount of time I've cooked my three-and-a-half pound chickens. When I pulled it out of the oven the first time, Dennis said, "It's. . .still bleeding." Sure enough, there was still blood around the back of the chicken, whereas if it were finished, it would have just been clear juices. When I checked Google, it seems the general consensus was you should leave a chicken in the oven at 350°F for 20 minutes per pound of chicken. Good to know going forward. This was a really good chicken recipe. . .the only thing about it was that while it was in the oven, the smell was so strong, it caused eye-watering. The smell wasn't bad. . .just very, very strong. We had to open the front and back doors to get the air flow going so we could breathe normally. However, this was declared the "best chicken I'd made yet," so there's that. 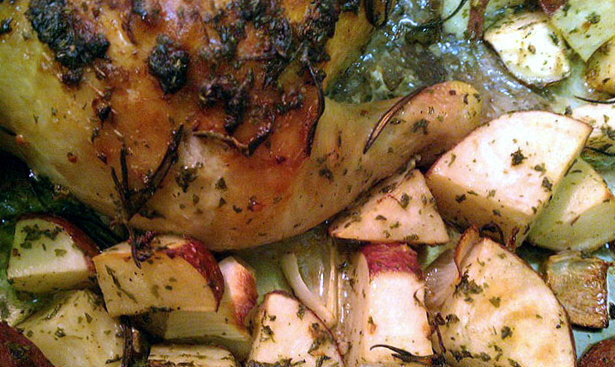 Combine parsley, mustard, lemon juice, garlic, pepper, salt, 4 stemmed rosemary pieces, and 2 Tbsp. olive oil in a small bowl. Blend well. Set aside in a smaller bowl 3 Tbsp. of this mixture. Put 1/2 of the onion and 2 stalks rosemary inside the chicken. Place in baking pan. Rub the parsley mixture ( minus the 3 Tbsp.) on the outside of the chicken. Put in the oven for 30 minutes. While the chicken's in the oven, toss the potatoes and the other half of the onion, separated, with 1 Tbsp. olive oil. Then, toss with the 3 Tbsp. of reserved parsley mixture. 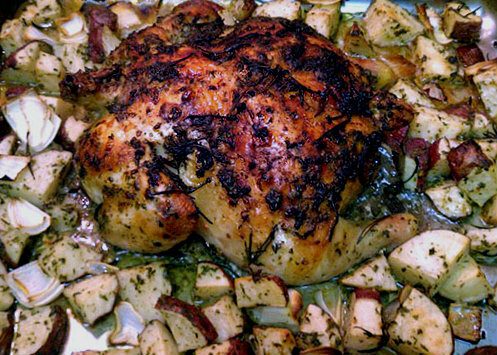 After the 30 minutes is up, take the chicken out of the oven and arrange the potatoes and onions around the chicken. Bake for another hour, or until juices run clear. 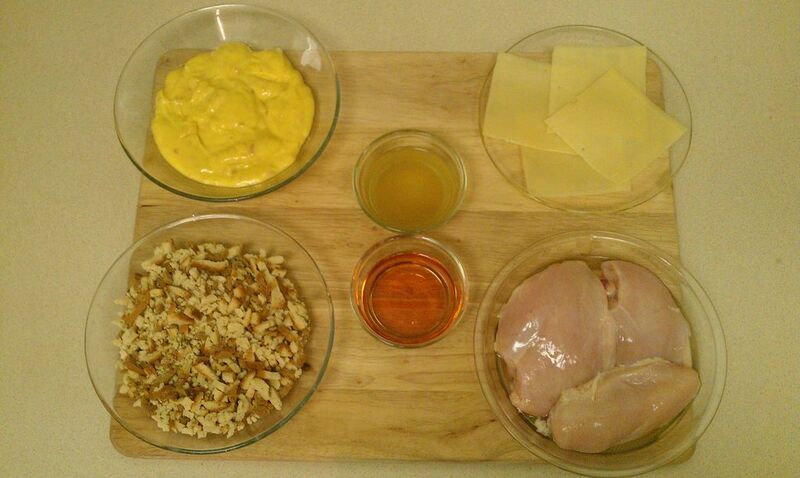 Let chicken stand 10 minutes before slicing. One thing that drives me kind of insane about food blogs is how a lot of them don't document the terrible things they make. They won't tell you that for every fabulous Chicken Marsala or Fillet Mignon they make, there was a really awful Beef Stroganoff or a Tuna Casserole that left their families in bed with food poisoning for a week. 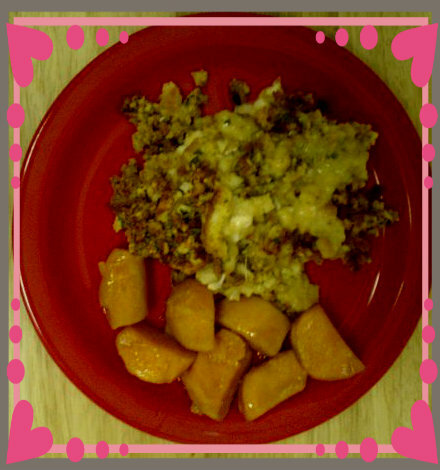 So I'm here to tell you that the dinner I made that was supposed to fill this blog post was. . .not good. It was unattractive, and tasted like nothing. It's not even that it tasted bad. It's that it literally had no flavor and looked weird to boot. Poor Dennis was a trooper. He told me later, "I was so worried you were going to love it!" because he knows how I am about stuff I make. But in this case? I ate it, because it was late and that's what I'd made, but it wasn't good. It just wasn't. Not even with salt. 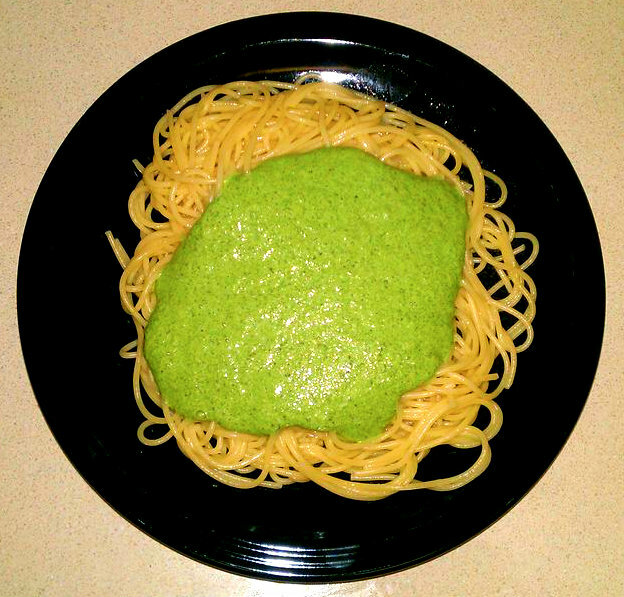 It tasted like a big plate of Nothing Sauce on pasta. In Dennis' words, "Well, what it lacks in flavor, you made up for with your working so hard to make it." He's sweet. But there's no way around the fact that this recipe was terrible. As such, I'm not going to bother posting the whole thing here: I wouldn't want to inflict that on you. Instead, I'm going to put up a recipe out of the Rachael Ray cookbook that I didn't have the chance to post a couple weeks ago. I made it while I was home by myself for that week, and it was pretty amazing. A warning, though: It's a pretty in-depth recipe, on the Intermediate cooking level (or at least for those who can manage multiple tasks in the kitchen at once) at least. But I'd say it's worth it. 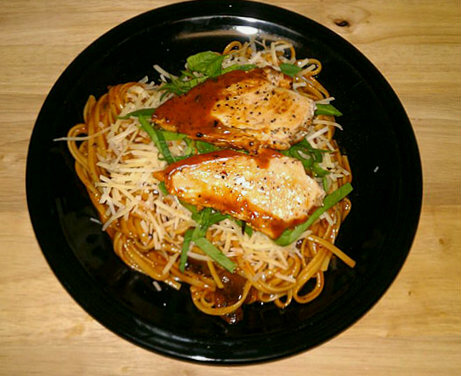 As always, some variations were made to this recipe. I only mention this because the recipe name mentions pappardelle pasta, which I'd never heard of, and I used a different pasta. Also, I cut way down on the number of mushrooms used, because I just recently have accepted mushrooms as an acceptable form of foodstuff, so I wasn't sure if I'd like them. I did. While the pasta is boiling, season the chicken with salt and pepper. In the same skillet you were cooking the chicken in, add the remaining olive oil and half of the garlic. Cook for a minute, then add mushrooms to the pan. Cook the mushrooms until they become brown and tender, about 9 minutes. While the mushrooms are cooking and in a separate pan, melt half of the butter. Stir in the tomato paste and heat through. Add the remaining garlic, cook, stirring, for a minute or so. Add the rosemary and the flour, cook for one minute, whisking. Add broth and Worcestershire sauce and stir. 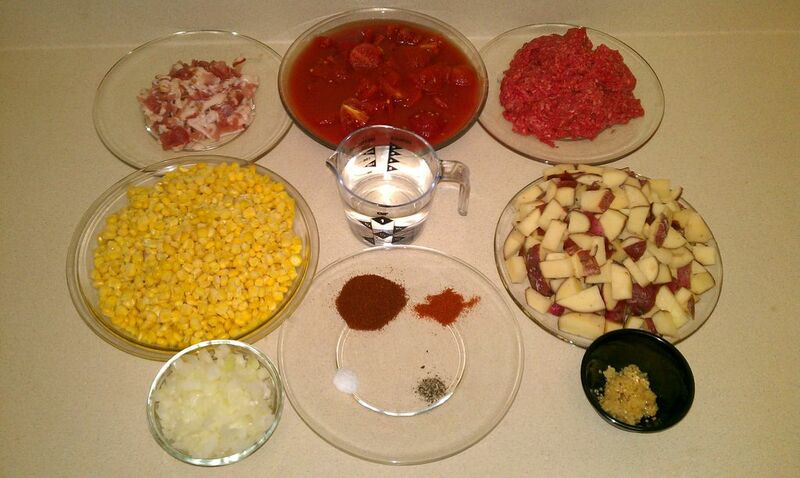 Simmer the gravy until it thickens, 3-5 minutes, and add salt and pepper to taste. To the cooked mushrooms, add the wine and reduce for 1 minute. Add the remaining butter and stir. Put the chicken into this sauce to warm it through. 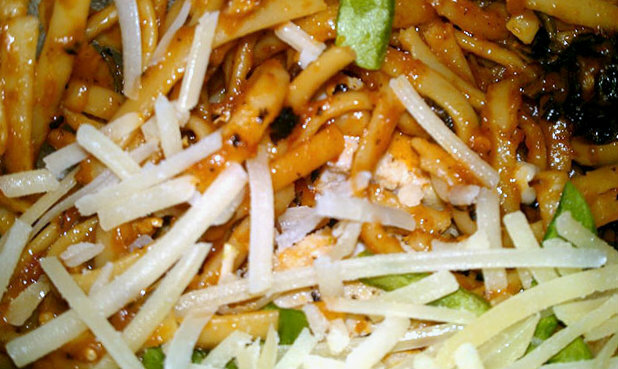 Drain the pasta and toss it with the gravy and some cheese. Put on top and put some spinach and more cheese on top. I don't know who Jan is, but her casserole is delicious. I've had several different variations of the same type of dish, but this one seemed especially easy to make, and the leftovers were just as good for lunch the next day. It's a great meal for those days when you get home from work and just don't especially feel like messing with dinner, but doggonnit, the people in your house want to eat anyway. 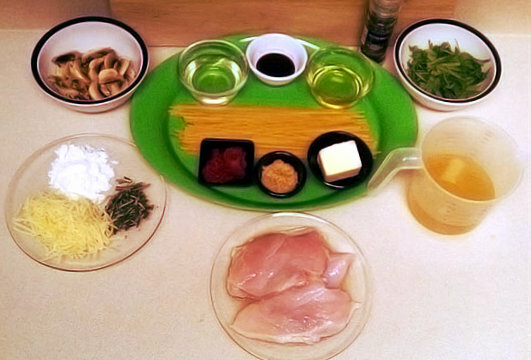 I've included the full recipe for 8, but I only used 4 chicken breasts, since there are only two of us. I also made some canned candied sweet potatoes, which I'd never had before. I found them at Aldi, and they turned out to be pretty awesome. 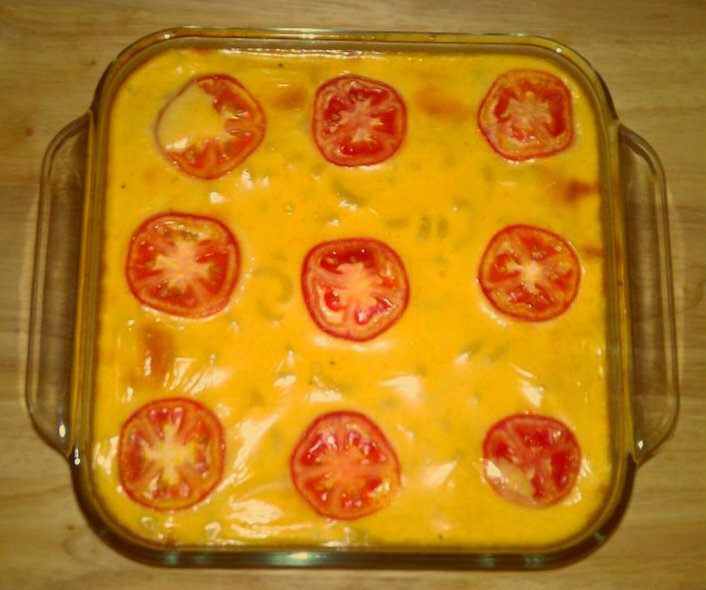 Place the chicken in the single layer in a glass baking pan. Top each piece with a slice of cheese. In a separate bowl, mix the soup and wine. Pour mixture over the chicken. In another bowl (or, you know, the same one if you rinse it out), toss the stuffing with the broth until well-mixed. Sprinkle stuffing mixture over the chicken. Bake for 40 minutes or until chicken is cooked through. Oh, wait, sorry. Valentine's Day chicken! I don't recall where this cookbook (Healthy Favorites From America's Community Cookbooks) came from. I suspect I got it from my grandmother's house when she told me she didn't use them anymore and I could take the ones I wanted. 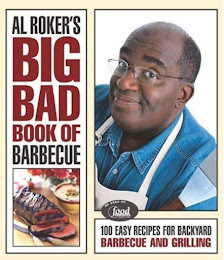 I'm pretty sure that when I made the recipes I did out of this cookbook, I completely negated the "healthy" part of it, because it suggests low-fat turkey bacon and no salt added tomatoes, and I didn't. . .heed to any of that. I don't necessarily like turkey bacon and I'm a big fan of salt, so there you go. If you want to healthy up this recipe, that's fine. This was a really good dinner. My only complaint was that there wasn't as much liquid as I'd anticipated, but I suspect that was something to do with how long I simmered it. Just keep an eye on the stove if you want more liquid in it. One last thing: I don't feel like the bacon added anything to the recipe, but Dennis said it wouldn't have been as good without it. I just depends on how you feel about bacon, I guess. Pour olive oil in a large pan and heat over medium heat. Add onions and bacon and cook, stirring often, until bacon is cooked and onions are soft. Add garlic and beef to the pan and cook until the beef is browned. 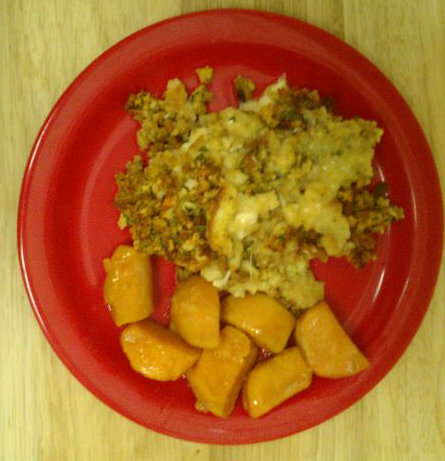 Drain the grease from the pan and move mixture to a separate plate. Blot the mixture, if that's your thing. Return the mixture to the pan. Add the potatoes, tomatoes (juice included), water, and spices. Bring the mixture to a boil then reduce heat to medium-low. Cover and simmer for about 10 minutes. Stir in the corn. Re-cover and simmer for another 15 minutes or so, or until the potatoes are tender to your liking.